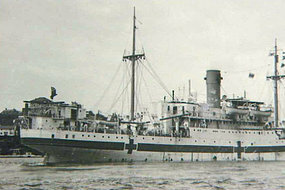 A search team has discovered the wreck of Australian wartime hospital ship Centaur. The WWII ship was torpedoed by a Japanese submarine in 1943 and sank off the south-east Queensland coast. Centaur search director David Mearns says the wreck location is about 30 nautical miles due east of the southern tip of Moreton Island at a depth of 2,059 metres. Mr Mearns, who also led the searches for HMAS Sydney and Kormoran, says the discovery is quite an achievement. "It's a great sense of relief and satisfaction," he said. "Every time you find a shipwreck like this it's a little bit different and this was very, very hard compared to Sydney and Kormoran, whose finds were almost instantaneous.